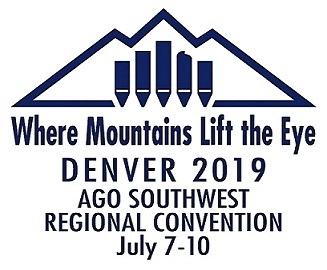 Colorado is the new member of the Southwest Region of the American Guild of Organists. As such, it is my pleasure to welcome you to our great state, and to invite you to share with us as we celebrate the gift of organ and choral music in Denver. A wonderful program of events has been created for you. Hosted by the Denver Chapter of the AGO, we will enjoy the music presented by world-class artists and ensembles, learn and grow professionally through insightful workshops, network with colleagues and new friends, worship in unique and profound ways, enjoy excellent food and fellowship, and hear newly-commissioned musical works by composers from this country and beyond. And we will share a gift unique in this time – music and the joy it can bring to the world. With deep gratitude to the members of the Steering Committee for this convention, it is my hope that you will come to Denver to partake in all things that Denver is. Explore our city and the music in it! At an elevation of 5,280 feet above sea level, Denver is truly a mile high!